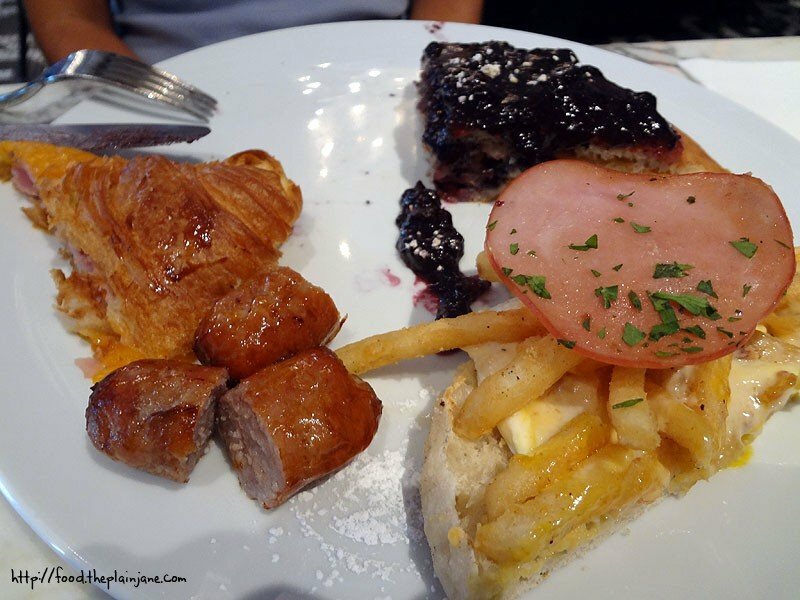 The Sugar Factory American Brasserie actually wasn’t on my “to-eat” list for Vegas. I had wanted to go to a burger place but I saw an ad and a coupon for the Sugar Factory and my interest instantly peaked at the words “Sugar” and “Factory”. I guess I really do have an insane sweet tooth. 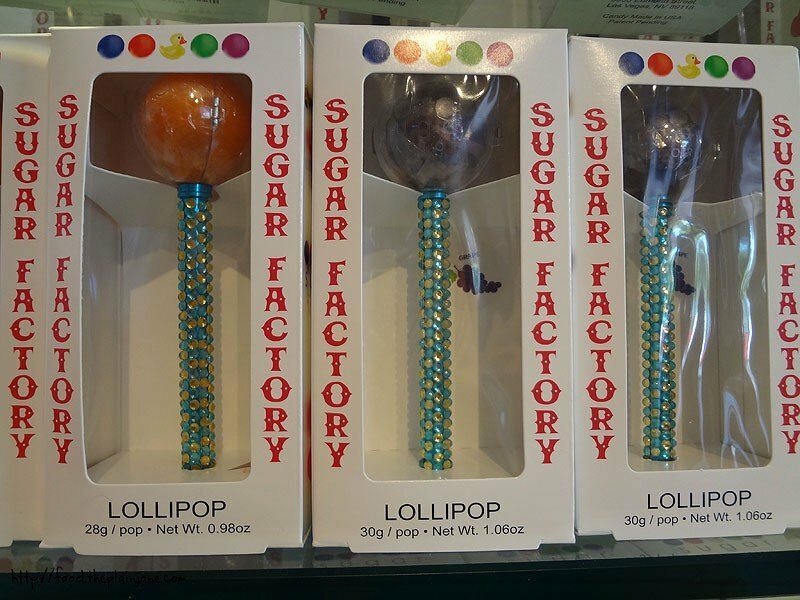 There are multiple locations of the Sugar Factory shop on the Strip, but only one restaurant – which is open 24 hours a day and located inside of Paris Las Vegas. After looking over the menu, I was convinced enough to convince everyone else that this was where we should go for breakfast the next day. And we did the “share all of our food” thing again. It worked really well. I always want to get the sweet stuff for breakfast but I usually get quickly overwhelmed by the same sweet flavors. Jake and I usually share a savory dish and a sweet dish to balance out all of the flavors. Laura choose the Blueberry Pancakes, covering us for the “sweet” part of our breakfast. 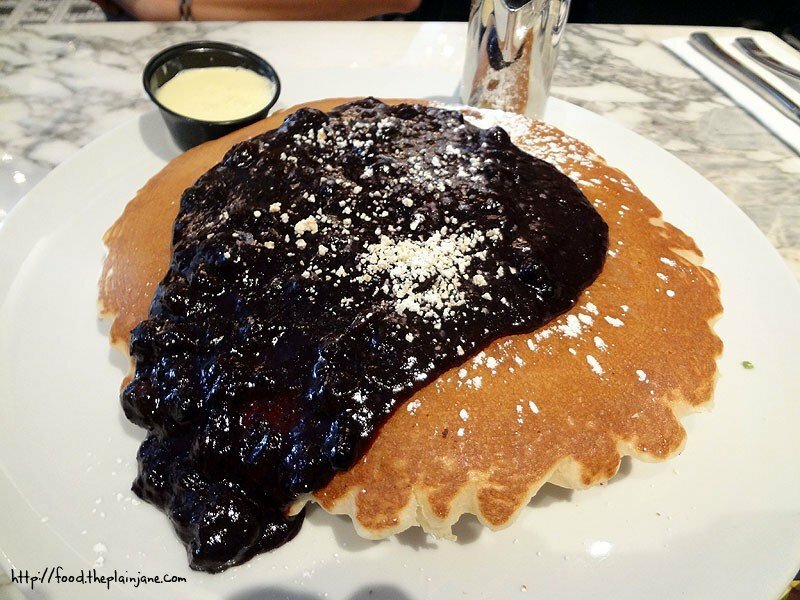 These pancakes are HUGE and you get a stack of three of them. I found that I didn’t even need to add any maple syrup to these babies since they were sufficiently sweet with the rich blueberry compote. The pancakes were very fluffy and delicious. I wonder how they get that pretty edge to them? Do they have a giant pancake mold? The vanilla bean sauce that was on the side was also very good and gave another hint of flavor to the pancakes. These are definitely sharing-size pancakes. 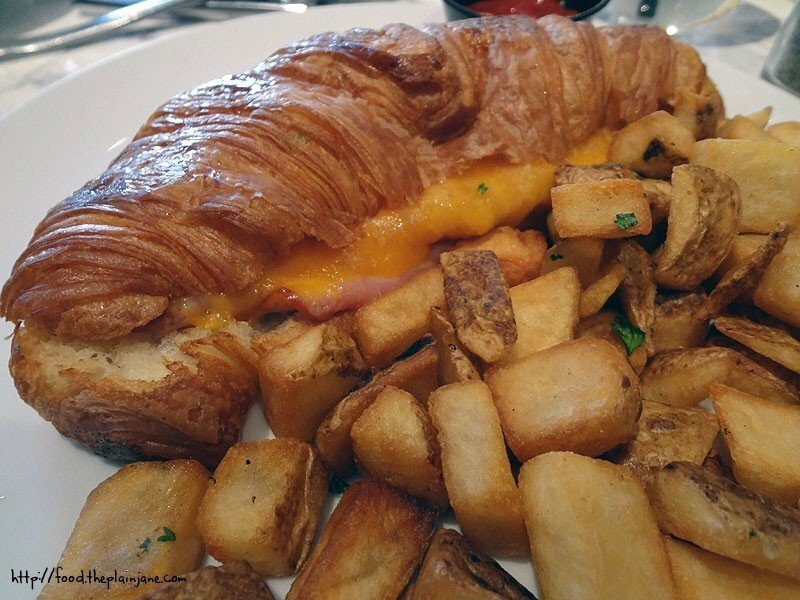 Chris ordered the ham and cheese croissant and split it into four neat little pieces for all of us. I mostly just ate the croissant because I’m a weird girl who doesn’t like ham that much. The croissant was buttery and flaky though, just the way a good croissant should be. Jake and Chris loved the sandwich, ham lovers that they are. I ordered this. Something about it just sounded terribly intriguing to me. It kind of reminds me of our carne asada fries, but this is like a breakfast version with country gravy instead. I loved it! It helped that I only ate a quarter of it so I didn’t sick of it, too. 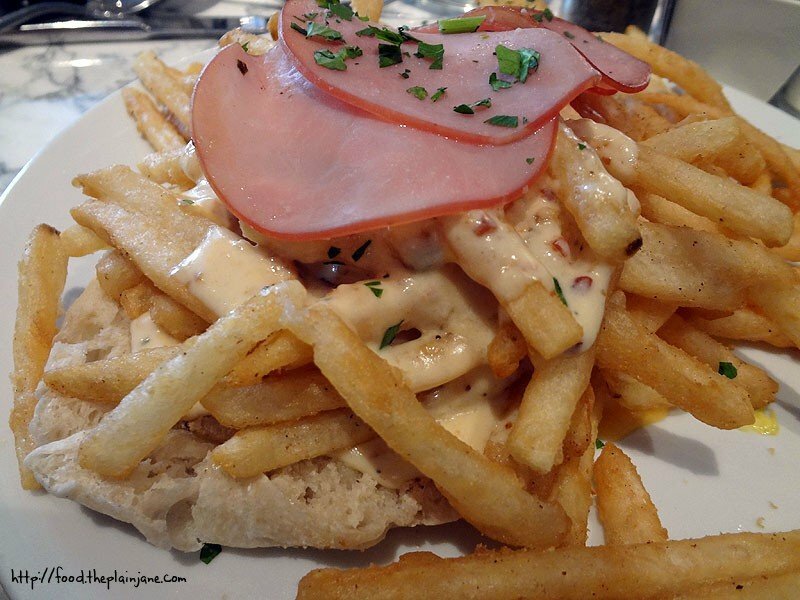 The Canadian bacon adds a nice bit of saltiness along with the crispy fries and the country gravy helps pull it all together. There could have been more gravy (Jake certainly thought so) but still a unique dish. I also decided we needed another meat on our plates. 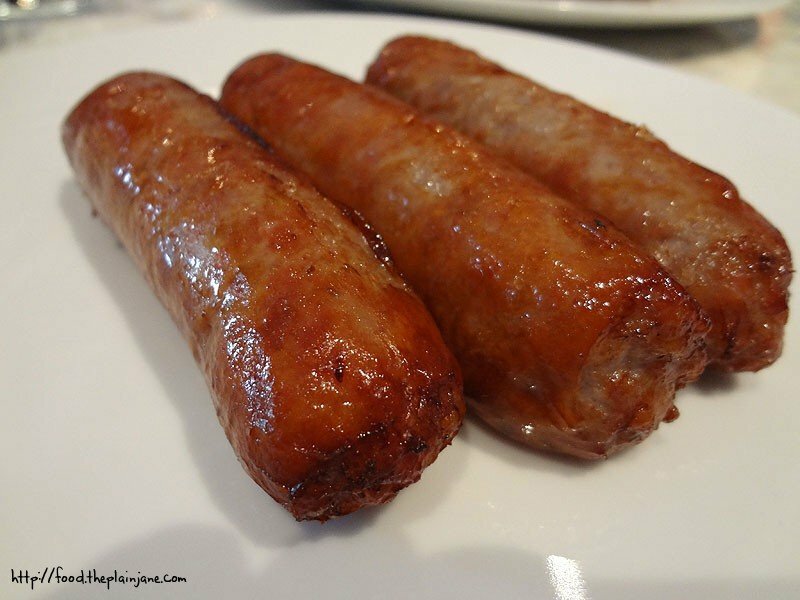 These grilled country sausages were perfect – cooked perfectly with a nice crisp and bite, they paired well with all of our breakfast items. This was the only really super disappointing thing I ordered. 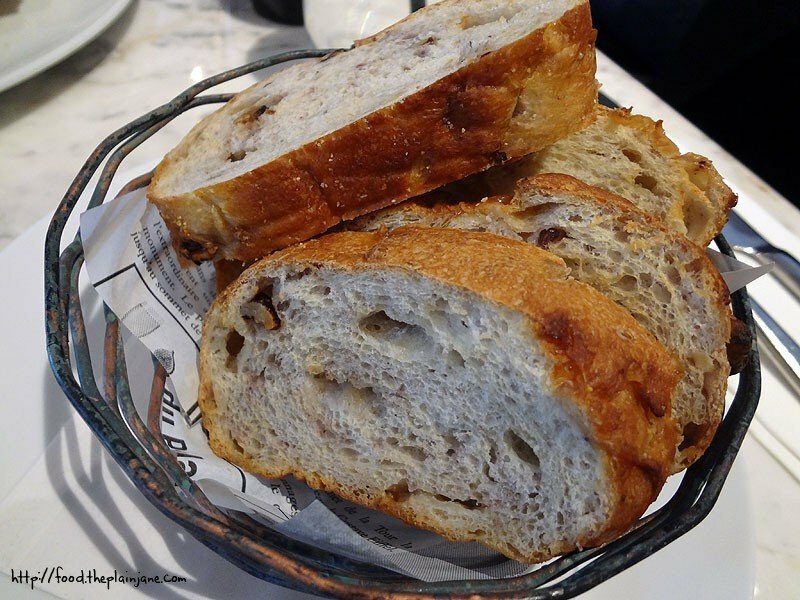 White Chocolate Bread sounds like it sound be really awesome, right? I was expecting a soft bread with swirls of white chocolate or little chunks, but I got neither. Instead I got dry, very crisp bread with nuts in it. Um, where is the white chocolate? Did I miss it? Apparently I did. This ended up being boring and not tasting very good at all. On the menu it says “White Chocolate Bread and Jam” for $6 – but since I didn’t get any jam, I guess they knocked a dollar off. Little mixture of food items all on one plate! 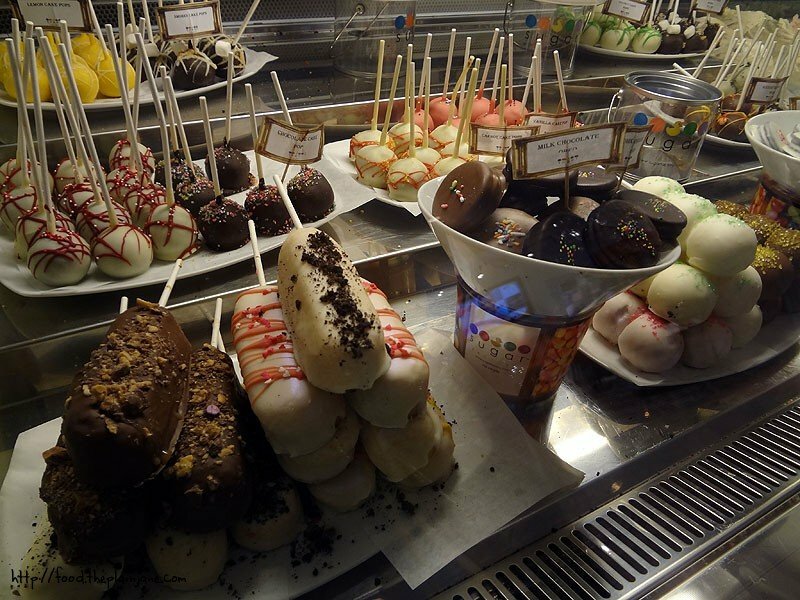 Right next to the restaurant is the Sugar Factory candy store – filled with all kinds of delicious candies and treats. 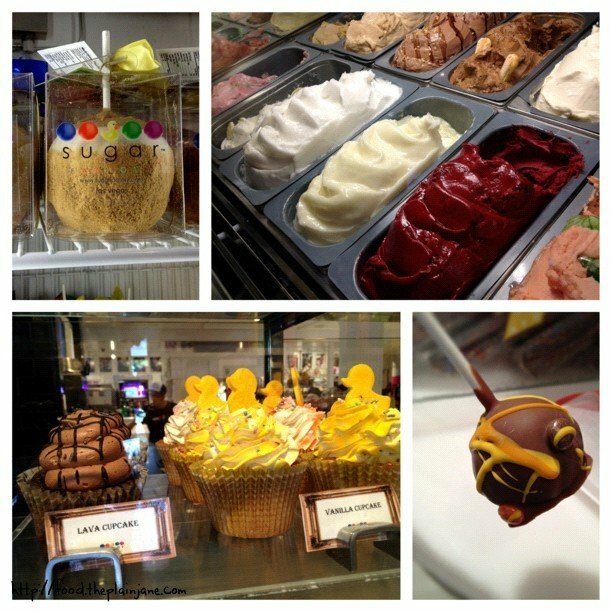 In a big case they had all of these chocolate covered lovelies, as well as cupcakes and gelato. There were also these crazy blinged out lollipops. I think they were like $17 each. I have no idea why anyone would want to pay that much for a lollipop. I had to top off my visit with a little sweet treat, so I got this little Reese’s Cake Pop for a mere $2 bucks. 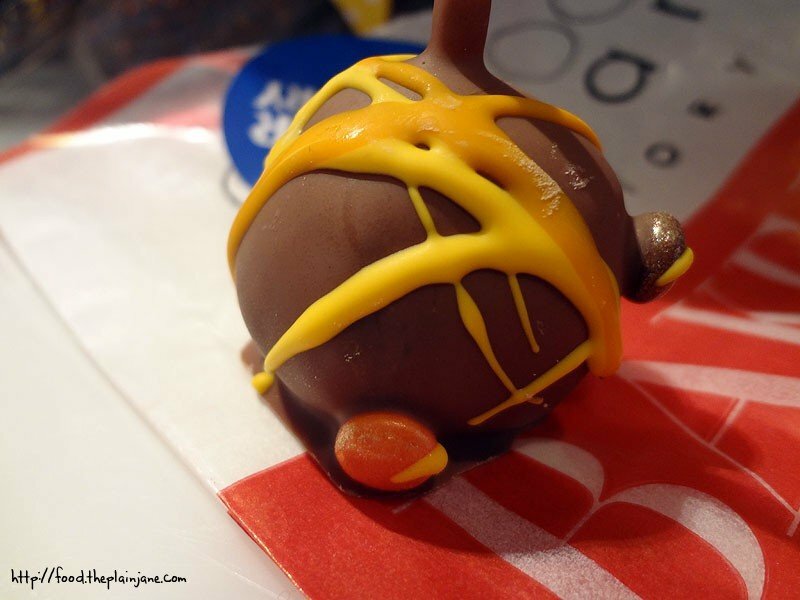 The inside is all chocolate cake with a milk chocolate shell and Reese’s Pieces stuck to the outside. Not really any peanut butter on the inside, which was only a little disappointing. 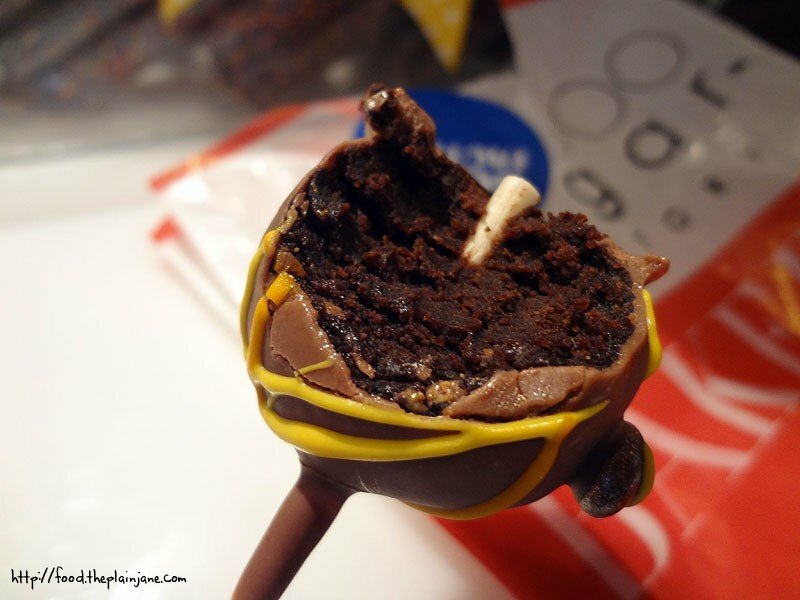 The cake pop was almost fugdy like – I dug it. All in all our breakfast was another success as we filled up with some good food before walking around in 100 degree heat for the rest of the afternoon! Hey, another person who doesn’t really like ham! Looks like you enjoyed a pretty good spread – those pancakes look fantastic. I’m sad the white chocolate bread wasn’t great. I got all excited because my mom loves white chocolate bread (I think it’s served at The Waverly in Vegas) but when she gets it, the bread is warm and soft and you can see the melty pieces of white chocolate. She’d be sad if she got a piece of hard bread with no discernable chocolate. I don’t like ham either! The texture is weird. Give me bacon or sausage any day. Whoa, everything looks great. It would be so hard for me to choose one thing from their display case. Hi Leanne – Ham is weird. Jake loves it. I don’t understand why. I was really bummed about the white chocolate bread! The one you mentioned sounds more like what I was imagining – whatever I had was just sad. I plan to do more off-strip eats whenever I go to Vegas again! Hi Darlene – I agree! Bacon and sausage is way, way better. I’ll even eat Canadian Bacon over ham. I also had a hard time selecting just one thing to try – it all looked so good!